The Aerosol Particle Analyzer, held by Theresa Thibodeau, flew on one of the Apollo earth orbital flight to measure microscopic liquid matter in the spaceship. 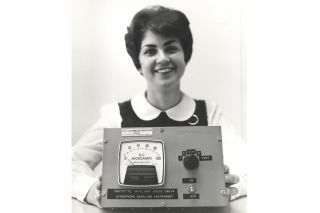 In this historical photo from the U.S. space agency, this Aerosol Particle Analyzer, being displayed by Theresa Thibodeau of the Instrumentation Laboratory, was flown on one of the Apollo earth orbital flights. The device measured content of microscopic bits of solid of liquid matter in the spaceship cabin for possible effect on the well-being of the astronaut or the reliability of the electronic equipment. The ERC opened in September 1964, taking over the administration of contracts, grants, and other NASA business in New England from the antecedent North Eastern Operations Office (created in July 1962), and closed in June 1970. It served to develop the space agency's in-house expertise in electronics during the Apollo era. A second key function was to serve as a graduate and post- graduate training center within the framework of a regional government-industry-university alliance.